Costway Portable Instant Water Heater is perfect for all outdoor enthusiasts who want the luxury of a hot shower, while enjoying the outdoors. When it comes to outdoor activities, there are several to choose from like hiking, hunting, and camping. Some may have a certain amount of luxury, which means that you would be able to rent a cabin and take a nice hot shower. However, let’s be real. Most of us will be staying in a tent to maximize the experience. So, if you choose to, chances of showering with hot water are quite low, and you might think that there is no solution to that. These days portable instant water heaters are becoming very popular. Not only is it great for showering but it is also beneficial if you want to wash clothes or dishes. Since more people are becoming outdoorsy and wish to have one, there are several brands and models available on the market today. However, only a few them have fantastic quality. Hence, to make your search for one easier, we chose to review a product that is considered as one of the best. An excellent portable tankless water heater is a quick and fantastic way to get hot water. The best thing about this product is the convenience it offers you. So, whether you are at a campsite or in an old-time rustic cabin, this product will offer you hot water at just a flick of a switch. With that said, let us briefly discuss some of the top features of the Costway Portable Instant Water Heater. This product has an ideal size. Its overall dimensions are 12.6 inches by 10 inches by 11.4 inches. The length of the water pipe and the shower water pipe is 63.8 inches and 107.5 inches, respectively. Its gas type is propane and has an 11-inch WC gas pressure and can also be powered by two 1.5V DC batteries. This water heater has a heat input of 18,000 BTU and it all weighs just 17.3 pounds, making it quite easy to carry around. If you lack the power to use this water heater, there are no worries yet. This product can be mounted on to your vehicle using the 12V DC pump wire. This will allow you to get a constant flow of hot water at any time. Since this heater can also be used outdoors, it is essential for it to have a convenient method of storage. That is why the company has provided a storage bag that fits perfectly in the trunk of your car. No matter how cold the weather will be, this product will always provide you with hot water. This works great whether you are using it for camping, hunting or even fishing. This water heater along with the quick connect pump will provide you with an average of at least 0.8 gallons of water every minute. This means that even when you are roughing it outdoors, you will get a steady supply of hot water. It goes without saying that any device that heats water for you should come with a ton of safety features. So, the company has ensured that if the temperature of the water exceeds beyond 167 degrees Fahrenheit continuously, then the heater will automatically shut off. Additionally, it also features anti-off-balance protection, which means that the heater will shut off the gas supply by itself if off balance occurs. When you buy this product, along with the water heater itself, you will get one pump, one water pipe with shower and one gray bag. Likewise, Costway offers a 30-day money back guarantee for all their products if you are dissatisfied with them. This portable water heater is convenient to bring anywhere you need hot water. It is compact and lightweight to store away easily. The product’s shower pipe has a long length for ease of use. It can be installed in different locations and can be used in multiple outdoor activities. This heater can provide the right amount of hot water throughout the day. The hose snap on the fittings may not work unless you run them under hot water to soften it up. Having a portable water heater will make your outdoor activity experience better and more convenient. That is exactly what Costway aims to provide with their fantastic instant water heater. This water heater has a weight and size which make it portable. We can guarantee you that this equipment will fit very well in the trunk with the help of the bag the company provides. In addition to its size and weight, it is also loaded with quite a number of features. For starters, this heater will provide you with a consistent flow of hot water throughout your stay in the outdoors. It comes equipped with the right accessory that you can connect to your car so that you keep getting constant hot water without hassles. The company has also ensured that the heater is packed with an overheat protection system for you to have peace of mind while using it. We compared the Costway Portable Instant Water Heater to the Camplux Outdoor Portable Water Heater since it is also compact in size and lightweight. Likewise, both of these products can be powered by batteries and have enough safety features. However, although the two products are quite similar, there are a couple of features that make the former water heater better in comparison. Let us list some of them for you. For starters, the Camplux Water Heater has a shower hose that is only five feet long, whereas its counterpart has a shower hose that is approximately eight feet long. Additionally, it lacks the complimentary bag that comes along with the Costway Water Heater. 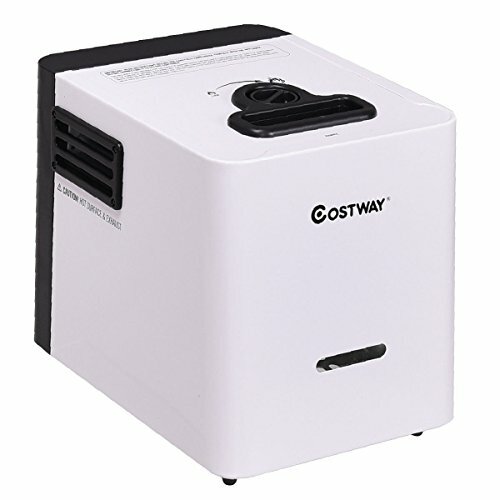 Lastly, the maximum temperature of the heater is higher for Costway than its counterpart. The Costway Portable is a must-have product for anyone who loves to be outdoors. That is because you are assured that you will have a consistent supply of hot water without worrying about your safety. You will also not worry about where to place the product when you will bring it with to the site as well as back home since it comes with its own bag.